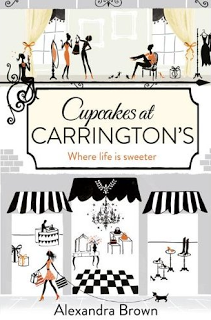 Since I first saw the cover of Cupcakes at Carrington’s and then read the synopsis I couldn’t wait for the new year to come around so I could get my hands on a copy and delve into the world of Carrington’s! I cannot believe this is the author’s debut book. The storyline flowed beautifully catching our interest and teasing our taste buds from the first page! The cover is classy and chic and I was hoping the storyline was going to be in fitting with the cover and true to form it was. With Georgie having a dream job working in the glamorous Clarrington’s department store on woman’s accessories selling unbelievable priced handbags which I could only dream of owning and then on her breaks being able to pop along to her best friend Sam’s cafe for a delicious red velvet cupcake. All this sounds like pure perfection but poor Georgie’s life is far from perfect. Brown creates a wonderful cast of characters in this book but not all are lovable we have our characters we love to hate too and even these characters were brought to life through Browns descriptive writing. The friendships the author creates seem genuine and I found the friendship between Georgie and Sam very touching when they come together at a very difficult time. I loved the male characters in this book I found Tom had an air of mystery surrounding his character I couldn't tell if he was a good guy or a bad guy until all becomes clear later in the book. The authors descriptive writing doesn't stop with the characters it continues in creating the perfect setting inside the department store. Carrington's came to life in this book you felt as though you were walking around this store with the characters and you can visualize the merchandise that the characters are surrounded by. I was hoping that there would be more mention of cupcakes but then that is the greedy sugar monster in me picking holes in the book! I couldn’t put this book down so I ended up reading into the small hours of the morning just to get to the end I was well and truly hooked by this entertaining and addictive book I am so pleased to hear that the story doesn’t end with this book, I cannot wait for the next book in the series to come out later in the year I for one will be eagerly awaiting getting my hands on the next book. I can highly recommend this book it is pure enjoyment on every page so treat yourself to this deliciously entertaining read on this cold winter day.